I think I'm going to go to the quilt shop today to get some backing fabric to match it and try to get it finished up today. I would love to also find a good book on quilting. I really would like to take a beginner's class, but I didn't see any listed in the shop newsletter. Maybe in another month or so they'll have one. Thank you for the encouragement everyone!! :) It's so much fun to learn something new! I also worked on My Lady's Quaker last night. I got the bottom of her skirt finished. It's looking so cute. I'll take a pic when I have a little more progress. Write soon! Good job Nicole! Looks great, even though the seams might not match up exact! Wow, Nicole! I am very impressed - it looks wonderful and you really did a lot yesterday! The Quaker Lady is so pretty - I can't wait to see what colors you chose. It's great Nicole! Congrats! You did a beautiful job! Wow that was quick! I think it turned out great. Look forward to seeing more. It looks great from here! I think you've been bitten by the Quilting Bug! The colours are great. I hope you do find a quilting class in the fall. They're a lot of fun. I'm sure your shop can recommend a good book. Wow, Nicole, you sew very fast! I love the blues and browns you used, it looks great. I can never do triangles right, so I'm jealous! Great job Nicole!!! Your seams may not match up, but it's hard to tell that. You did such a wonderful job for your first quilt. The key to getting everything lined up is pinning, pinning, pinning! One book that I love is Fons and Porter's Guide to Quilting. And I have one other one that I use a lot, but it's packed up right now. As soon as I unpack it, I'll send you the title, but the F&P book is really good. The other may be the Complete Guide to Quilting but I'm not sure who it's by. I'll let you know. That is really beautiful Nicole!! You did a really beautiful job on it! If you happen to find a good learning book, please let me know. I have always wanted to learn and so wanted to take lessons in Harlingen TX when we lived down that way. But without a car, I never did get to do that. The fabrics are gorgeous. I can hardly wait for LHN's new Library pattern to come out. The snippits are lovely. Your first quilt - great job Nicole! The book I love to use is "All About Quilting from A to Z". It has really helped me a lot! Looks wonderful ! I have never quilted, but took a look at the pattern and it seems pretty straight forward, so I may give it a try, just need to find some fabric. That looks great! Check with your shop -- a lot of shops do one-on-one lessons for newbies. Once I get done with all my gardening work, I may have to make myself give one a go!!! Wow!! This is beautiful!!!!! You really got a lot done!!!! I just happened upon your blog while searching for directions on how to use Rolaframe that I got from a friend. Your stitching is beautiful! !I love the Riddle. Your quilting is great too. Glad I found your blog. I love cross stitch so addicting! You Go GIRL! I just love those colors...and do you think anyone's seams are straight totally? NO! They aren't! Make "peace/piece" with your sewing machine and you'll have a whole other hobby! Great job Nicole. I'd like to learn to quilt too! Wow Nicole its lovely and its your first - you are a natural. Beautiful! 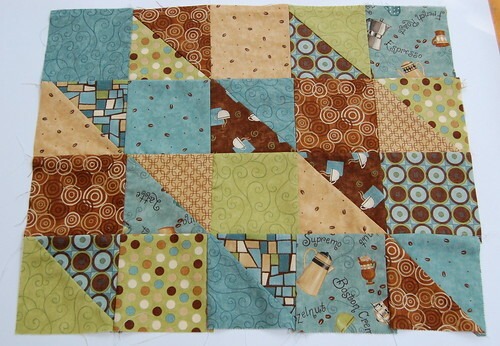 I love the coffee fabric! Gosh, Nicole, I've been slow in keeping up with blogs and now you're quilting! Very cool. I do love your Finch Song - something is peaceful and light about it. I was catching up on your other posts, too. Your sons are so grown up now! And very handsome, too! and a very nice job too. they are a bit on the pricey side but the amount of time they have saved me is priceless! As I am one of those fussy seam people who will undo any unmatched seams & resew, these pins are worth every cent - they really work! Looks beautiful, Nicole!! I love those fabrics so much. There are some interest quilting clips on youtube..I love browsing them. Can't wait to see when it's all finished! Oh wow, it's great! Love the patterns can't wait to see it finished :-). Is really beautiful! wow!!! I like it so much! Georgia Bonesteel has some good hand quilting books. I learned to quilt based on one of her books. They are out of print now but can usually be found at the library. You did a wonderful job on the piecing. 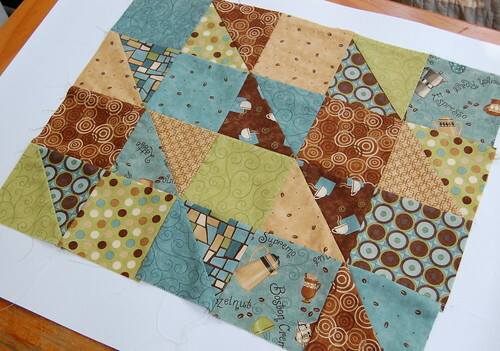 I always say the little mistakes and mishaps give the quilt character! Now you have me inspired to pull out my machine and make a trip to the fabric shop! For a first time attempt, I think you have done a splendid job.